Auto bank draft is the easiest, most convenient way to pay your electric bill. No more checks, no more stamps. With auto bank draft, your payments are transferred to us directly from your bank on or around the twenty-sixth of each month. It saves you time and money; and it’s free! Automatic bank draft bill payment is designed for customers who would prefer to spend their time on something other than writing checks each month. You’ll have one less check to write and keep track of each month when you pay your monthly electric bill automatically from your bank account. It’s easy and simple. You’ll see your electric bill payment debited on your bank account statement each month – all automatically. I authorize Cookson Hills Electric Cooperative, Inc. (CHEC) to begin monthly deductions for payment of my electric bill and for the financial institution named to pay each amount from my checking or savings account on or around the 26th day of each month. I understand that no changes can be made within 48 hours of the scheduled draft date. I understand that I may cancel this authorization by notifying CHEC to remove my account from the Electronic Payment Plan and that CHEC will have 30 days to change my billing. Enrollment into the Electronic Payment Plan may take up to 45 days to process. I will continue paying my monthly bill as usual until my bill states “Bank Draft – Do Not Pay”. I understand that CHEC reserves the right to terminate my participation in this Electronic Payment Plan at any time. I further understand that if two bank drafts are returned for Insufficient Funds, my account(s) will automatically be terminated from the Electronic Payment Plan. 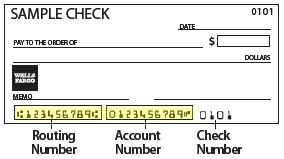 You must be in Billing Cycle 4 (Residential - bill due on the 1st of the month) to use this form.